I'm a simple man who finds the simple things in life the most fun and over the last three years I have been attempting to perfect the ultimate pumpkin carving. As Halloween approaches I thought I'd give you my easy ten step cheaters guide to carving pumpkins that will leave people dazzled, amazed and basically accusing you of cheating. If you are particularly artistic you can substitute the drawings below with your own. Personally the best two that I have carved have come from my own drawings copied from books with my own unique twist on them - the two below took over three hours each to carve so before you start think how much time you have spare. Think this through before you pick up the largest on the shelf - how big is your picture? Choose a pumpkin that is too big and the carving will get lost, but pick one that is too small and you'll be making that long slog back to the supermarket. Personally I look for one that has about 10cm either side of the image - so if the image is 30cm across then you need a pumpkin that is at least 50cm across. I also look for one that has one large flat side where it has rested on the ground - trust me, it makes carving easier. It is essential that you have the right tools for the job. It is best to invest in a cheap set from the supermarket but you can make do. I've put what I would use as a substitute in brackets. You'll need a fairly long and sharp knife to cut through the top, a scoop (tablespoon) that has a sharp edge, a prodder to mark the outline (a sharp pencil or thin knitting needle) and finally a small saw (a saw from a pen knife). Mark out with the prodder where you want the lid to be and then push the knife directly down into the pumpkin. Repeat all the way around the outline and then push. The top should break away and then you can get some purchase under the lid to flick it out. Once you can get your hand inside take the scooper and erm......scoop. You'll need a big bag with no holes in (a mistake I made the first year) and away you go. Now you can either save the flesh to use in a recipe - if that's what you are expecting here - jog on lol. How much the pumpkin will glow depends on how much of the interior you remove. Personally I remove as much as possible so that not only do you get the stunning image lit up but you also have a pumpkin that gives off a weird ghostly glow. As the title says, choose your design. Cut out as much as possible and move onto the next step. Get some pretty strong tape and tape your image into position. You won't be able to get it completely flat but close. Take your prodder and simply press down onto the outline of the image at spaces of about 1 cm. Once you have done this on every edge in the image remove the paper and wait for ten minutes. What you'll find is that where the exterior flesh has been punctured it becomes darker. You should at this point be able to see the outline of your image. Take the saw and push it into the outline of the image and as the title says, saw like there is no tomorrow. Personally I saw away small sections at a time. It is far more manageable and you can keep track on steady progress. Continue to do this until all of the sections that need to be cut away have been done so. As a final once over I insert the prodder into smaller sections to make sure that the holes are big enough and that light can shine outwards. If there is a blockage it will look rubbish. Light and drop some candles into your bad boy and pop the lid on. Stand back, take some photos, share on social media and gloat. Text friends and point out that "I knocked this out in half an hour" while secretly wishing you hadn't developed carpal tunnel syndrome it has taken so long. 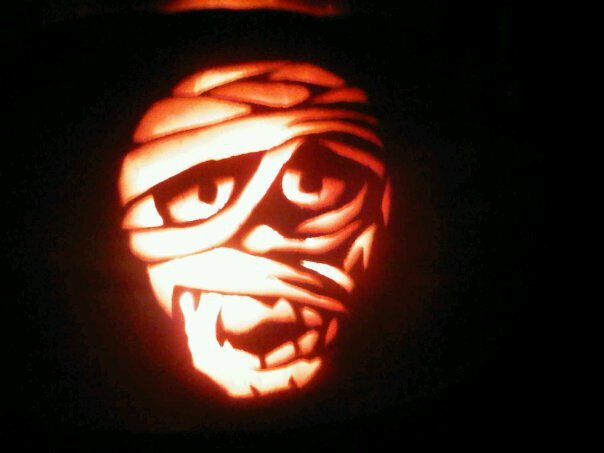 Now I know you are dying to see the final product - well here it is.....Total time taken to carve = 1.5 hours. Do you like the cheaters guide to carving pumpkins? What are you doing this Halloween? great tips! I always draw mine on free hand but the tracing idea would let me do much more creative designs. Thanks! The illuminated carved pumpkins look amazing and your instructions make the job sound simple. Of course it takes a lot of time to create a work of art out of an unwieldy vegetable. But you have reason to be proud of your achievement. I bought a similar kit which came with those tools and transfer, I didn't actually realise how you do it properly so thank you! They look great! We will being doing ours later in the week, but I am certain my kids will take control of the design leading to something far less pro looking! You have done a great job. My tip would be to cut off the bottom rather than the top! wow, your pumpkin ended up fantastic! Superb job and post. My pumpkin is still intact on the worktop. Oops! This is such a useful post because I'll definitely be carving some pumpkins this week! Your design looks great! So cool! 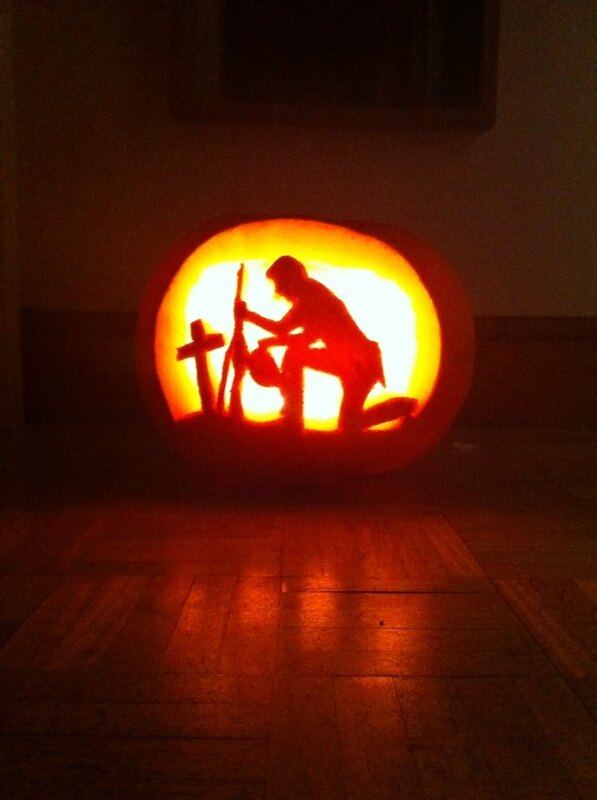 I am great with creative things, but I'm not sure if I could do that well with a pumpkin!